Orkneylodge is an impressive and substantial building set in a most breathtaking location with seaward views over Scapa Flow towards islands including Hoy, Flotta, Cava and Fara to name but a few. Constructed in 1997 as a purpose built hotel, this modern property has many exceptional features including a conservatory, dining room with dance floor, a spacious bar plus bright and airy reception with comfortable seated area. The letting bedrooms have quality en-suites offering very comfortable and well-appointed guest accommodation, all set to ground floor level. Orkneylodge provides spacious owners accommodation over two floors, comprising of a spacious open plan kitchen / diner / lounge plus five double bedrooms, with the master being en-suite. These existing facilities offer new proprietors both a spacious home and superb trading facilities allowing for the flexible use of accommodation to suite an extended family operation. The business offers tremendous potential for further development within the spacious one acre grounds. There are two lapsed planning applications which offer significant scope to increase the accommodation and letting capacity on the site. One application is to build a 3-bedroom house with double garage using an existing building (10/107/pp dated 1st March 2010). In addition, there is lapsed planning to increase the letting accommodation to include a further 12 suites on the first floor. The vendors purchased Orkneylodge in 2002 and have, since then, operated it as a rewarding and successful venture. They have invested in the property and established a sound business model. The owners have decided to present this opportunity to the market as they now wish to retire from the hospitality sector. Orkneylodge is found in the hamlet of Houton on the beautiful Orkney Islands coastline situated between Kirkwall (10 miles) and Stromness (8 miles). The Houton Ferry, only a 1-minute walk from the lodge, provides regular services to Flotta and Hoy generating a level of passing trade. 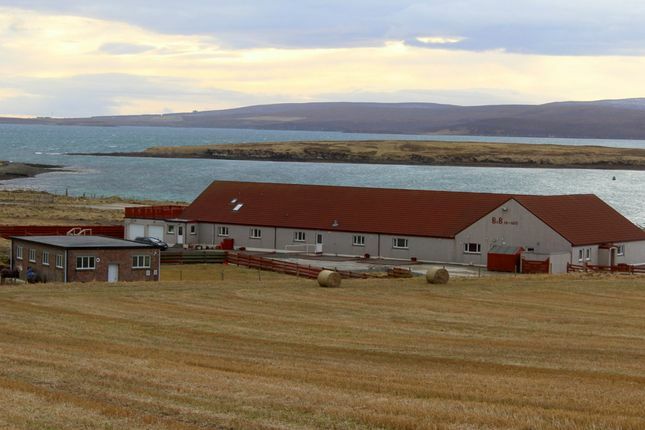 The location of Orkneylodge has a strong history as the extant building was constructed on the site of a second Word War Naval Station which in turn replaced a World War 1 Sea-plane base. The guest house has stunning views across Scapa Flow which had a momentous role as a naval base. Kirkwall is the Islands main town with around 9,000 inhabitants offering a welcoming community, supported by well-established infrastructure and social facilities locally. The standard of education in Orkney is also extremely high with Kirkwall Grammar being recognized as one of the best in the Country. Kirkwall is a major administrative and communications centre with Ferry Services to Aberdeen and Lerwick. The Town has a strong history encompassing pre-history, Pictish and Viking heritage which is reflected in the many places of interest to visit. The islands are home to around 21,000 inhabitants, who enjoy an enviable quality of life, amidst stunning and varied scenery, all bounded by the ever-changing sea. Besides abundant wildlife, Orkney holds possibly the greatest concentration of archaeology in nw Europe. Visitors can also enjoy the vibrant contemporary culture and a wide range of activities including excellent fishing, bird watching, golf, climbing, walking and sailing, though many simply enjoy the peaceful ambience of the islands. There are two distilleries within 11 miles of the guest house. Orkneylodge is a 2-storey modern property set within a substantial footprint. From the hard-standing car park, access to the main building is via a double-glazed door with a security entry system. Upon entering the charming entrance hall is the reception desk with seating area, guests immediately appreciate the quality and comfort on offer with attractive decor and finishing throughout the property. From the main reception hallway a door to the left leads to the bar area which in turn leads to the dining room which is set to 10 tables, offering ample dining capacity. The dining room has a wooden centre dance floor and could easily be set up to seat 50 plus diners should new owners wish to introduce a restaurant option. Through a further door for the dining room is the spacious conservatory which can seat 10 people and offers fantastic views of the shoreline and islands. The conservatory has comfortable wicker furniture and an electric fire. Off the bar area is the commercial kitchen making it ideally placed to provide a full catering service. To the right-hand aspect of the reception hallway is a wide corridor leading to the 8 main letting bedrooms, accessed from the dining room via a small hallway. The property has a well-provisioned commercial kitchen (in addition to a private family kitchen) offering ample preparation areas. Off the kitchen there are ample storage facilities and a further unit (previously the bar cellar). The business has a separate laundry and linen store. An attractive feature of this excellent business is the spacious owners accommodation which offers 5 double bedrooms with the master being en-suite. A charming feature of the master bedroom is that it has a private patio area which offers some of the most spectacular views. In addition there are two bathrooms; one on the ground floor and the other on the first floor. Also situated on the ground floor is the spacious open plan kitchen /diner / lounge. Access from the lounge to the rear aspects is via a vestibule which also has a door that opens into the double garage. The lodge boasts a good level of amenity ground extending to approximately 1 acre. The front aspects are pleasantly presented with water features. The majority of the grounds are set to hard-standing with a substantial car parking area marked for 24 plus vehicles. The private areas to the rear of the property are accessed via a large gate and have a wooden shed for general use plus a sand area currently used for the owners ponies. A large work-shop building is currently used as a stable; the owners use local pasture land to graze their ponies. It is this large building that has lapsed planning to be converted into a three-bedroom house. There is a double garage with electric doors attached to the main building. The oil tank is situated in an enclosed area and the lpg Gas cylinders are enclosed within a small wooden structure. There is also a wooden utility shed. The subjects benefit from mains electricity. Water is from a private source which supplies the hamlet. Drainage is by private facilities with ample capacity for future developments. Heating is oil-fired with the boiler being located within the main subjects. Cooking is provided by way of lpg gas cylinders for both the commercial and residential kitchens. The lodge has an integral fire alarm system and is fully compliant with legislation. Access is via an automated entry system with 4 internal communication points; guests are provided with an access code. The business is eho compliant. Wi-Fi is available throughout. The building is double-glazed throughout. Property descriptions and related information displayed on this page, with the exclusion of Running Costs data, are marketing materials provided by ASG Commercial, and do not constitute property particulars. Please contact ASG Commercial for full details and further information. The Running Costs data displayed on this page are provided by PrimeLocation to give an indication of potential running costs based on various data sources. PrimeLocation does not warrant or accept any responsibility for the accuracy or completeness of the property descriptions, related information or Running Costs data provided here.